Brooches at Barbara Briggs Designs - custom, unique, one-of-a-kind silver jewelry. Fibula - Origin late 16th century: from Latin,"brooch," perhaps related to figere "to fix." I truly enjoy making one-of-a-kind fibulas. Below you'll find a selection of interesting designs, some of which have sold. You may place a special order for a brooch, although some materials may no longer be avaible. 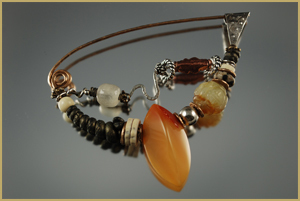 "Autumal" Fibula - This brooch combines beads of carnelian, river jasper, carved agate, ostrich shell disks, bone, antique etched glass, copper, sterling silver, and polymer clay. The body of brooch is made of hammer textured bronze wire with a sterling silver clasp. Sold. "Black Mamba" Fibula - Beads of antique etched glass, carved bone, bronze metal clay, sterling silver, and matte onyx are featured on this piece. A beautiful smoky agate drusy swings from the bottom, but I named the piece for the tiny black snake made of polymer clay that guards these treasures. 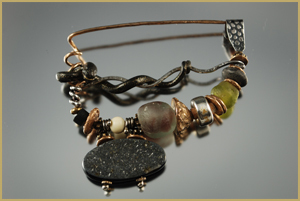 The body of brooch is made of hammer textured bronze wire with a sterling silver clasp. Sold. "Tortoise" Fibula - Flanked by beads of river stone, turquoise, bone, antique etched glass, carnelian, trade beads, disks of bronze metal clay, and two fine silver daggers, the focus of this brooch is the carved bone tortoise at the bottom center. The body of brooch is made of hammer textured bronze wire with a sterling silver clasp. Sold. 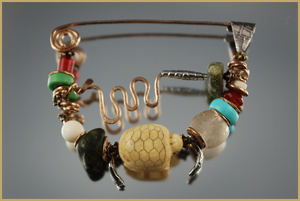 "Scarab" Fibula - Regarded as sacred in ancient Egypt, the large beetle holds court in this piece, which looks like it may have been found on an archeological dig. A bronze metal clay dagger charm is suspended at the bottom of the brooch. 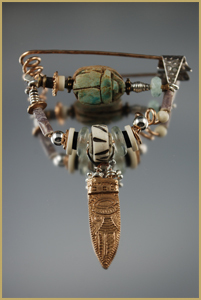 It is flanked by beads of carved bone, onyx, ostrich shell, strling silver, etsched glass, and bronze metal clay disks. The body of brooch is made of hammer textured bronze wire with a sterling silver clasp. Sold.